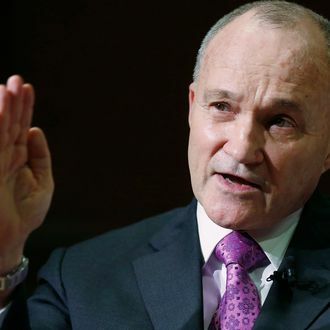 Clearly Ray Kelly is well qualified to run the Department of Homeland Security. In his nearly dozen years as Mayor Michael Bloomberg’s police commissioner, there have been zero successful terrorist attacks on New York and — at least by the NYPD’s count — sixteen thwarted attempts. Kelly has built an international intelligence network while driving the city’s crime stats to record lows: This year, New York is on pace for homicides to decline yet again, hitting their lowest levels in five decades. And clearly Kelly would love to be appointed to replace Janet Napolitano, or else he would have ended this chatter already: He will have no shortage of more lucrative options at the end of this year, but nothing compares to a presidential endorsement of your success, and the chance to operate on a truly global stage. Yet the politics of such a promotion are highly sticky for President Obama. The furor on the left, and in minority communities, over stop-and-frisk was already significant baggage for Kelly, but the not-guilty verdict in the Trayvon Martin case makes it even more of a factor working against him — even though there are significant differences between the muscular tactics of trained city cops and the borderline-vigilantism of George Zimmerman. The loudest pushback against the Kelly trial balloon so far has been from Democratic Brooklyn congressman Hakeem Jeffries; he’s likely to be joined by a chorus of civil-liberties groups. Then there’s the simmering controversy over the National Security Administration’s spying operations; does Obama want to stoke that problem by choosing Kelly, who has employed dubious surveillance methods in Muslim communities? And, petty as it may seem, Kelly also has a classic inside-the-Beltway problem: a reputation for not being a team player. The hard-driving commish has made plenty of government enemies over the years, mostly at the FBI, and mostly in service of protecting the city. Now they’re trying to persuade the president he’d be better off picking someone with a smaller ego who wouldn’t overshadow the White House. New York, of course, would be a winner if Kelly goes to Washington: It’s hard to imagine a better-placed friend of the city’s safety for the next three years. Bloomberg has been happy to let Kelly operate independently and to defend him ferociously when necessary. Obama, though, has to decide whether he’s willing to endorse Kelly’s methods as well as his record.